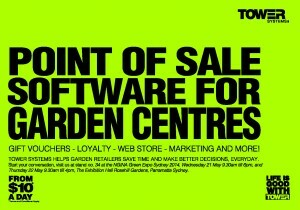 Garden centres love portable POS software terminal | A blog about smart POS software for independent small businesses. The feedback from garden centre owners and staff at the launch of our portable POS software terminal for garden centre software users recently has been wonderful. On the floor of the Green Expo the new terminal was a hit and in the time since out in the field Garden Centre staff have loved playing with the unit and seeing how it could serve their specific business needs. While we are primarily a software company, having an engaged hardware business partner in HP helps us to deliver excellent outcomes to our customers for hosting our software where and how they want. 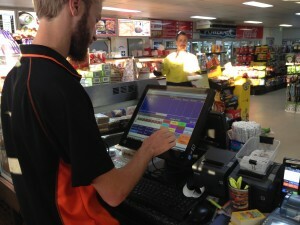 Fully functional POS software wirelessly in your business anywhere makes life easier for many businesses. You can tell when a software company you’re competing with runs out of steam when they use truckloads of words targeting your business and people in your business. The announcements here in recent weeks about Paypal, Xero, Plants Plus, Transactor, Postec fuel integration and other developments speak for our innovation and focus. We are loving customer responses. Here at Tower Systems we hear from our POS software customers by phone, email fax and even letter with questions on how to use the software. Some communications stand out more than others – like this one from one of our clients in Dubbo New South Wales. We love the reference to Dub Vegas. We love the smiley face with hair. We love the appreciation. We love the relaxed style. We love the clear communication. 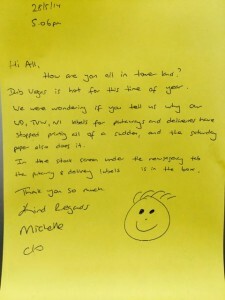 We are very lucky to have customers like this. It makes our days! Footnote: we removed identifying details from the fax out of respect for client privacy. 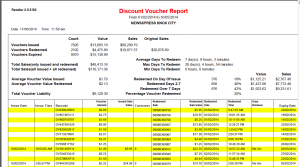 Tower Systems is sharing evidence of the successes being achieved by retailers using its front-end loyalty facilities called Discount Vouchers. 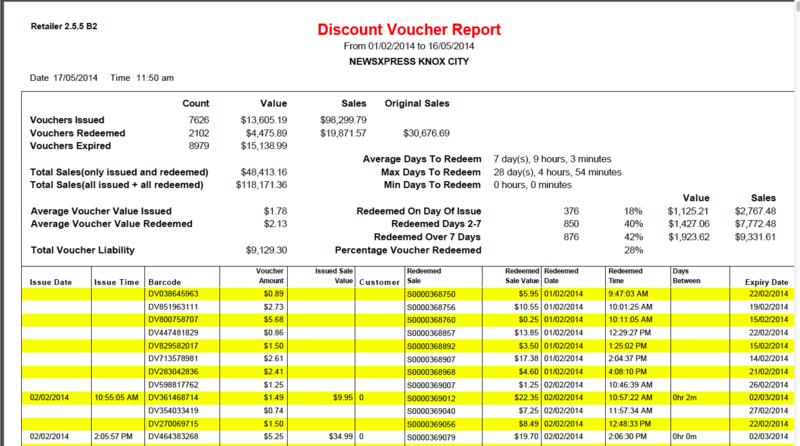 This evidence shows how one purchase leads to another and often another and how soon shoppers make the move using the reward on the voucher printed by the software. Now being used in a range of retail channels, the data set being built by Tower through retail business success stories is becoming an encouraging and exciting tool for retailers contemplating how they can improve their own situation. With retail business owners having complete control over the amount they offer as a discount and when, the levers for local business growth are considerable and the opportunities for independent small business retailers quire considerable. Tower Systems shares many examples so that those embracing this innovative approach to loyalty have access to case studies before making decisions appropriate to their business. On the long overdue retirement of Ken Fergusson, pet shop software company Tower Systems has agreed acquisition terms for Tilltek Asia Pacific on the understanding that service and support for existing Tilltek customers is maintained for the foreseeable future. 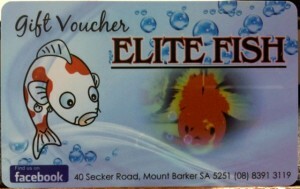 Tilltek is in use primarily in pet shop businesses around Australia. Tower Systems will assume full responsibility for the Tilltek software and customer service from this week. The Tower Systems pet shop software is already in use in close to 40 pet shops around Australia and it accepts electronic invoice and stock file feeds from a range of pet suppliers. The Tower pet shop software serves pet retailers in retail sales, stock control, shopper loyalty, theft control and accounting system integration. Several Tilltek software users have recently switched to Tower Systems. The company can provide reference sites to speak to the experience and benefits of such a move. The link between Xero and our Point of Sale software will benefit from advancement in our beta release program with another major retailer coming on board as they transition their business from MYOB or Xero accounting. We have been using the link for some time in our own retail business under the guidance of our in-house CPA and in association with Xero, serving their QA requirements. The expanded beta release brings us even closer to full commercial release and link between our software and the cloud based Xero accounting software. The 1,900+ newsagents using the newsagency software from Tower Systems have access to a terrific new software update that includes enhancements in sharing of data with News as is required of some newsagents in their contract with News. News representatives approached Tower with a change to the requirements in data sharing as part of our commitment to serving newsagents and their suppliers. The work was done to exactly meet the standards changes from News Corp. The changes are available to all Tower Advantage<sup>TM</sup> customers. The live link between our POS software and fuel dispensing management facilities now deployed in a major petrol retail business in Western Australia is serving the business well. Indeed, the deployment has led to more business for Tower Systems and this link that delivers a small business focused fuel dispensing solution from our proven and loved POS software. The delivery of this link is a major innovation for our software development and technical delivery teams. Many people in our company have every right to be proud. Having passed several regulatory steps and now been deployed, Tower Systems through this work is proving a commitment to compliance to standards as well as to serving the needs of a customer in a remote and challenging situation. Retailers using the POS software from Tower Systems are benefiting from greater flexibility delivered in the latest update in the area of management and allocation of freight charges by suppliers of retail products. Taking on board retail business owner suggestions, the handling of freight has been tweaked to better serve the way freight is being handled in a range of retail situations today. Freight is a cost of business for retail and apportioning it appropriately to the products involved is important for retailers to get to a true position of cost of goods sold. This latest update is available now for Tower Advantage<sup>TM</sup> customers. While more and more retail businesses are offering gift cards, the commercial success depends on the confidence of customers in the gift card product. A more professional looking gift card the more a customer is likely to trust the card. This is where Tower Systems can help. Thanks to our professional in-house gift card design and production service we are able to help independent small retail businesses to have a card that looks professional, trustworthy and valuable. Retailers we partner with often are thrilled with the cards supplied and the sales that result from their use. Any small retail business can compete with major retailers by offering professional plastic cards that make the business look great. 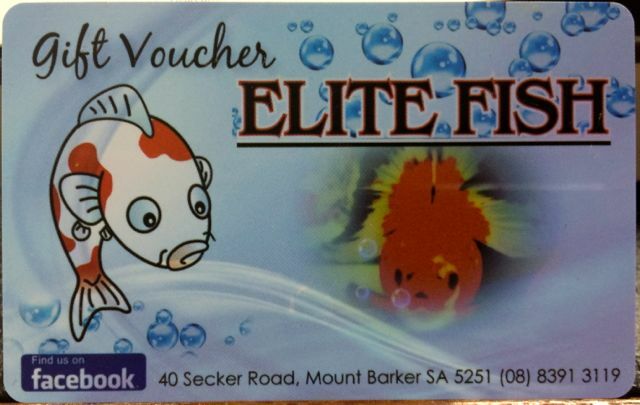 Done well, a gift card can help you win business you might otherwise not have won. The latest release of the Tower Systems Point of Sale software provides access to multiple addresses for a single customer. This is on use in a range of business situations including garden centres, pet shops, bike shops and other retail businesses. Using the new facilities that now provide even more options, retailers can deliver to a customer at multiple addresses – thereby offering customers greater flexibility. These latest enhancements have been delivered in a recently releases POS software update from Tower Systems for Tower Advantage<sup>TM</sup> customers. Tower Systems has released an update to its newsagency software for newsagents wanting to engage with the Bauer Rewards shopper loyalty program. This update was released more than a week ago and has been made available to all Tower Advantage<sup>TM</sup> customers. The work by Tower with the team from Bauer has been conducted for some months and under the terms of a confidentiality agreement. The changes have been developed specifically to meet the requirements of Bauer to enable engagement by Tower Newsagents in the Bauer initiative. Tower Systems has a track record of helping newsagents engage with supplier initiatives. Delivering supplier required changes to Tower customers for no additional cost. Tower Systems has been working with Paypal since last year on an innovative in-store payment option for small business retailers in the Tower Systems community. This work has resulted in an interface between the Tower Point of Sale software and a new consumer App being from Paypal. Having passed tests, trials and rigorous acceptance testing, the next release of the Tower software will support Paypal as a method of over the counter payment for shoppers shopping in retail businesses using the Tower software. This is genuine innovation that has come about as a result of professional development between Tower Systems and Paypal. We are thrilled to be the partner chosen by Paypal for this work last year – giving Tower Systems customers a wonderful commercial advantage. We will announce sign-up details shortly. The new cloud-based roster software developed by Tower Systems for small business retailers and others is attracting excellent feedback from a select group of beta test sites. We are thrilled with the feedback and support from colleagues working on this project with us. The result is an excellent cloud-based roster solution that is easy to use yet deep in functionality for small through to mid-size businesses. Retailers and other businesses will be able to use this using a low-cost subscription model that provides access to the platform as well as to email and text message communication to employees on rosters. This is a very leading edge solution we are proud to be bringing to the market. Here at our Point of Sale software company we seek out opportunities to support small businesses, especially small and independent retail businesses as part of a whole of business social responsibility commitment. We often invest our own time and money in projects where we feel we can help these businesses grow. It is part of our pro-bono work helping small business without an expectation of any revenue benefit for us. QRki, a QR code generation and content access platform for retailers and other small businesses as part of our social responsibility commitment. 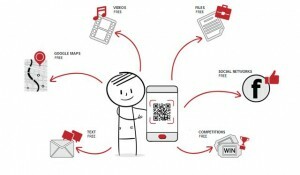 Retailers and other small business operators can make videos, files, competition entry forms, Facebook links and other online content accessible through a unique QR code they generate using the QRki website. 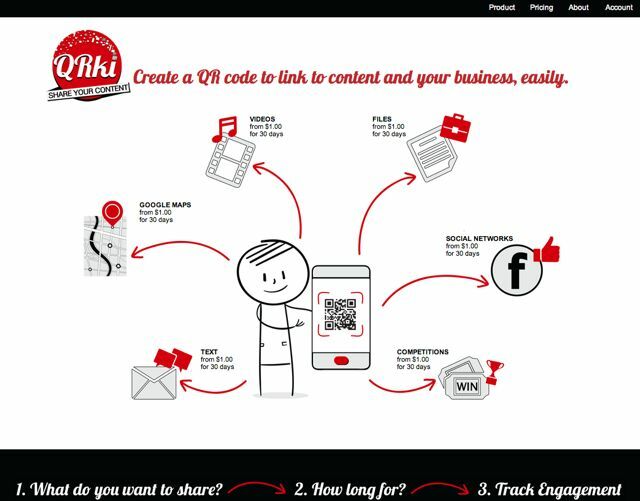 Developed in Australia but for use from anywhere in the world, QRki is another example of cloud based innovation for small businesses. Tower Systems has developed an interface between its Point of Sale software and a gift card platform used by many national and international franchise groups that enabled purchase and redemption across the franchise members. Users of the facility will have access to leading-edge gift cared tools and opportunities from a proven partner and from within the Tower software. This new interface has been developed by Tower for a regional department store using our software. It is also being made available to other customers, especially our franchise partners. Tower Systems has been using a direct Tower POS software to Xero cloud-based accounting software link for weeks now. This new link has passed Xero acceptance testing. The live use has been with one of our own retail businesses which we switched to Xero from MYOB for the testing. The results have been excellent: considerable time savings and cost savings compared to the MYOB link. Whereas we used a third party to facilitate sales data flow from our POS software to accounting software including Xero in recent years, this new link is direct and is available for a considerable cost savings to Tower customers. We are still in beta release and anticipate full commercial release shortly. In advance of this we are adding bonus additional functionality to extend the benefit opportunities of the Tower Systems Xero link over the more traditional MYOB link. 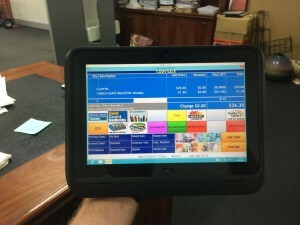 Having our own retail stores and an in-house CPA has made it easier for us to get this POS software to Xero link right. The innovation we are releasing with our Xero link demonstrate our commitment to ensuring the relevance of our product in a world of considerable change. Xero has become a leading accounting solution as a result of excellent software design and wonderful customer service. We have found the Xero team a delight to work with through this project. Added value – from purchasing from this business. Perceived value – how you package a product compared to how others package the same product can lead to a different price. a. Manage labour to focus on products with the best return to the business. This is a balance between overall gross profit dollars and margin percentage. b. Look at items with a customer service component, where your expertise is required to make the sale or make good use of the products or where there is a reasonable after sales service component. These can usually carry a higher margin. c. Look at the items which are unique to your business in your location or nearby. If you are the only store serving the local community then you do have a pricing opportunity. These items can usually carry a higher margin. d. Assess why people shop at your shop. If they are shopping because of convenience then you have the capacity to charge more for this. This is why convenience stores charge more for items which you can buy elsewhere for considerably less. f. Involve others in setting sale price. Ask your team what you can charge for an item. Assess what they think you can “get away with”. By polling team members, you may find that your perception on price is lower than what others expect. You can build a stronger business by taking small steps each day which focus on new traffic, better margin and improved sales efficiency. No grand plan, no expert strategy – just small steps which leverage opportunities which exist in your retail business. By paying closer attention to the margin you can achieve, you strengthen the financial foundation of the business and ensure that your return on inventory investment is more helpful to the bigger business plan. More and more small and independent retailers are using the free cloud based service called QRki from Tower Systems to harvest contact details from customers for email and other campaigns as well as to host videos of products and provide easy QR code based access to business Facebook pages. 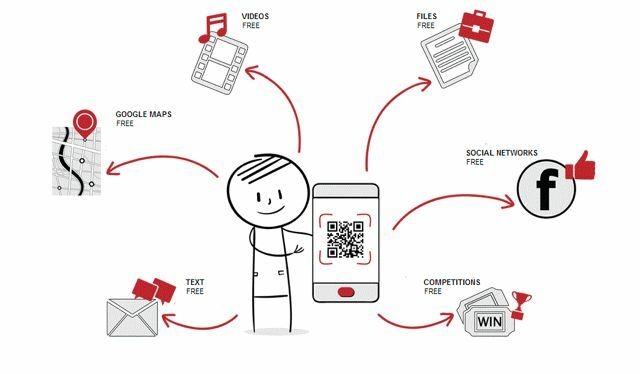 QRki generates a QR code that your customers can use to provide contact details, enter competitions, look at videos of products you load and look at other connect you may load. We developed and released this free cloud-based platform to help small and independent retailers to more effectively market and manage your business. QRki is another way Tower Systems is helping small and independent retailers. Thanks to supplier stock file and invoice interfaces in our pet shop software, Tower Systems is helping to bring more pet shops and pet shop suppliers together. Our work at the supplier level is another way our software separates from others in the market. Thanks to a stronger supplier / retailer connection both businesses win. We are grateful to offer the glue (the software) that facilitates this. Our latest Pet shop software supports more opportunities in this area. Tower Systems is thrilled to be supporting the work of the Lottery Agents Association of Victoria at their State Conference this weekend. On our stand we will have on show fresh POS software for lottery agents with which agents can expect to run more efficient and successful retail businesses. 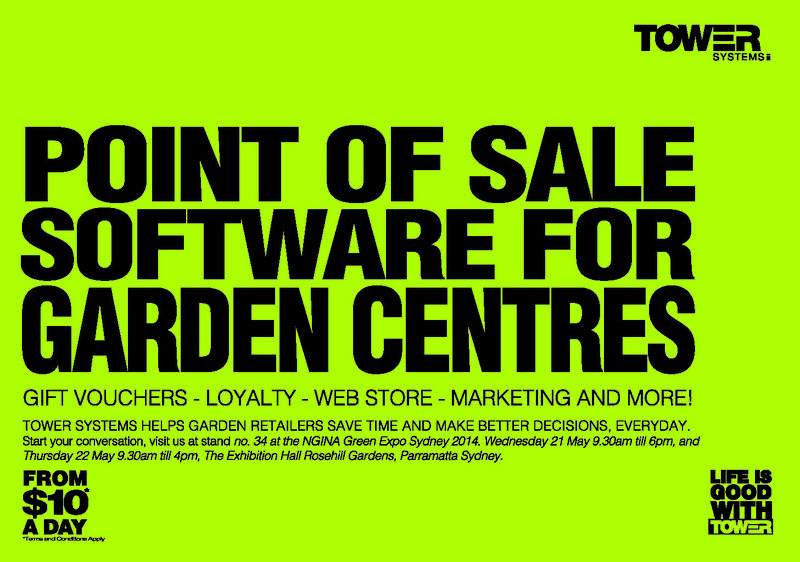 Tower Systems is thrilled to be participating at the Green Expo Sydney next week where we will show fresh Garden Centre Software offering bankable business opportunities to garden centres and nurseries. We are looking forward to meeting many of our clients and making some new friends. We appreciate our partnership with the NGIA and their welcome to this trade show event. The most valuable products may not be those that you sell the most. Sometimes they are, but not always. This is where smart retail business reporting can help a business owner look at product performance differently and discover gold within the data that helps you leverage products more. Thanks to reporting in the Tower Systems Point of Sale software, retailers can analyse shopping basket performance of a product – what it sells with. This can be assessed with in-store adjacencies. Combining these views can help a business make shop floor moves that drive even better outcomes. Another view of product performance could be sales over a period of time. This can help you better understand the return on retail space. Given that the lease for a retail business is one of the biggest costs for the business, knowing retail space return is key to determining the financial return you are getting from a product. Tower Systems provides access to a broad range of views of the performance of products in your business. We back this with helpful business support and analysis. Small and independent can save labour costs by carefully rostering employees based on the performance of the business across its opening hours. Thanks to detailed trading hour performance reporting in the Point of Sale software from Tower Systems, our retail partners can tap into data that will help them trim roster hours. Our sales by time reporting can also help shift hours from one part of the roster to another – to a time when the business could achieve an increase in sales by having more people available on the shop floor. This is where knowing sales by time becomes really useful – in chasing revenue growth through smarter rostering through the software. Our helpdesk team is happy to help and retailer using our software – to create a more valuable roster. Your best customers in retail may not be those who spend the most money. They could be those who purchase particular items, come back more regularly or engage with the business in other ways. The Point of Sale software from Tower Systems provides a range of metrics through which a retail business owner or manager can measure customer engagement. This data guides how a business manages customers, rewards them and even responds to opportunities uncovered. In measuring customer engagement and providing easy access to this, Tower Systems is helping retailers to make decisions based on customer value. This can change from business to business. E have worked in a range of retail channels where we have modified measurement to suit channel-specific needs.